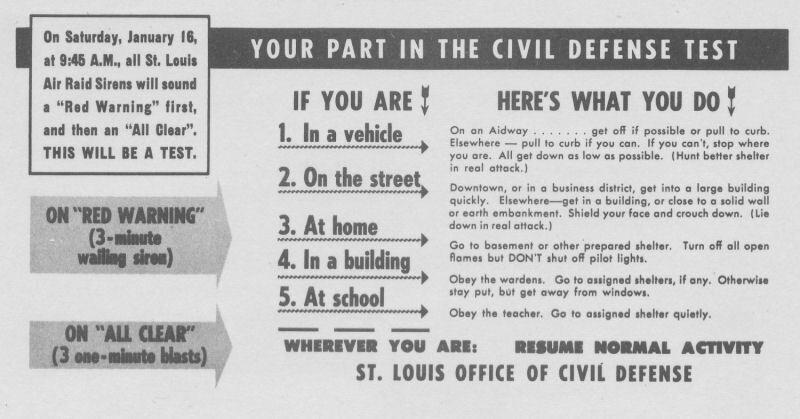 On Saturday January 16, 1954 at 9:45am the City of St. Louis Missouri conducted a city-wide Civil Defense attack warning test. I have obtained an original of the test report from a lady who found the report in her mother's belongings after her mother passed away in late 2012. She was very nice and offered it to me. She contacted me after finding my site on-line and asked me if I would be interested in the copy of a test. 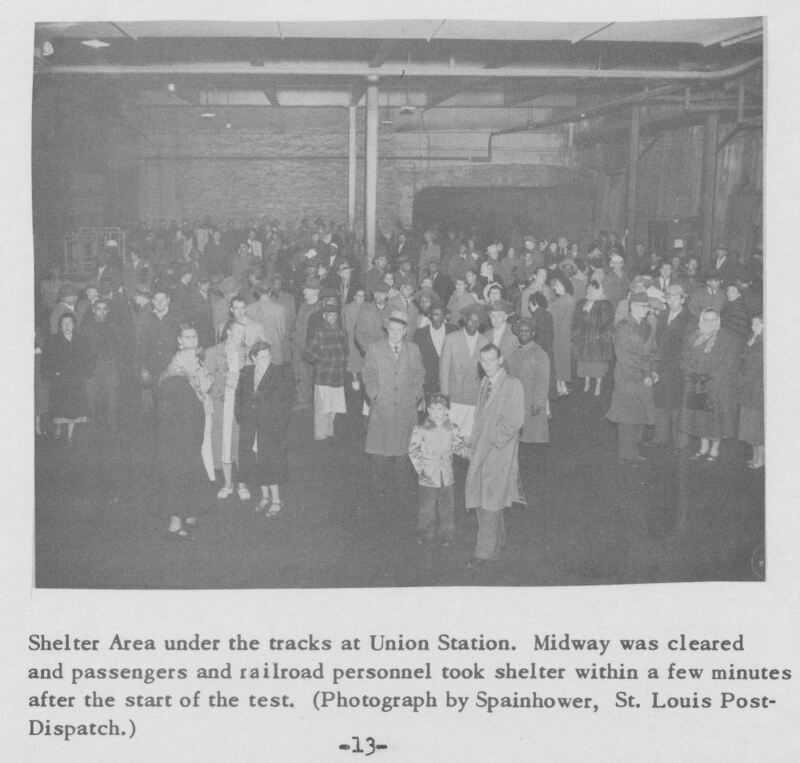 At the time I thought she was offering me one of the old home preparedness type of tests and I pictured in my mind's eye a page or two of questions like "what are the best items to stock in your shelter" etc. etc. I replied that I would be very interested in seeing it. When I received the item in the mail and opened the envelope I was floored! 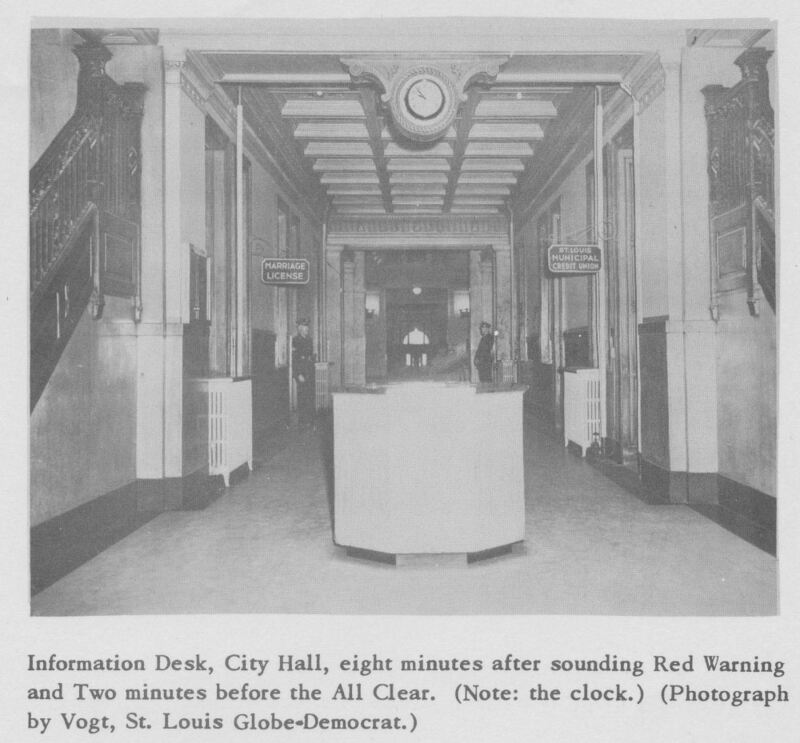 The document she sent covers a St. Louis Civil Defense test which involved stopping traffic on major roads, having the general public take shelter in buildings at the sounding of the attack warning signal on the city's sirens. 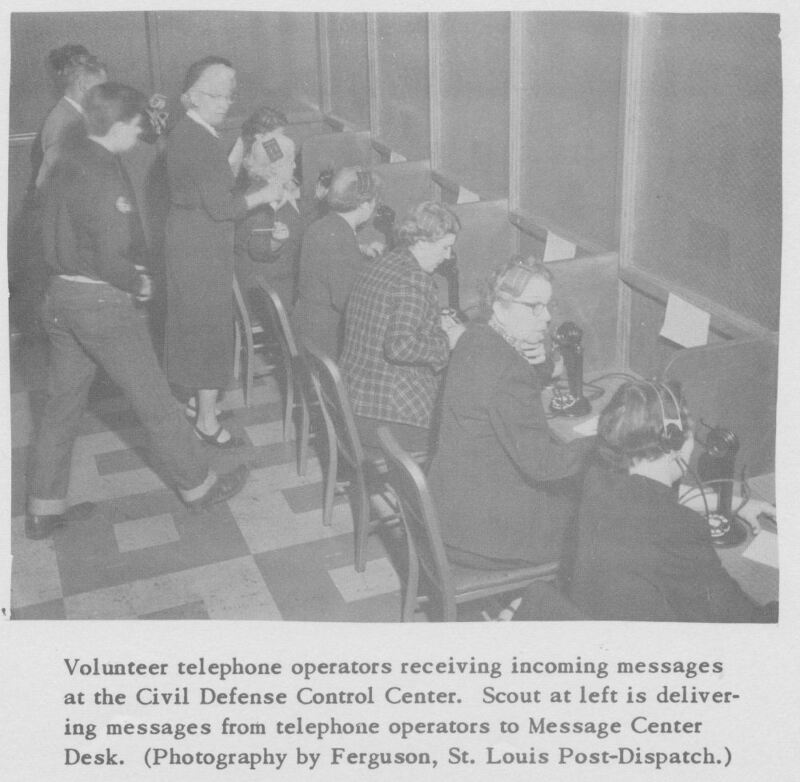 The results were reported in real time via telephone back to the Civil Defense control center. The journals of information received are also included. The report also covers the public information efforts undertaken to inform the public of the test. 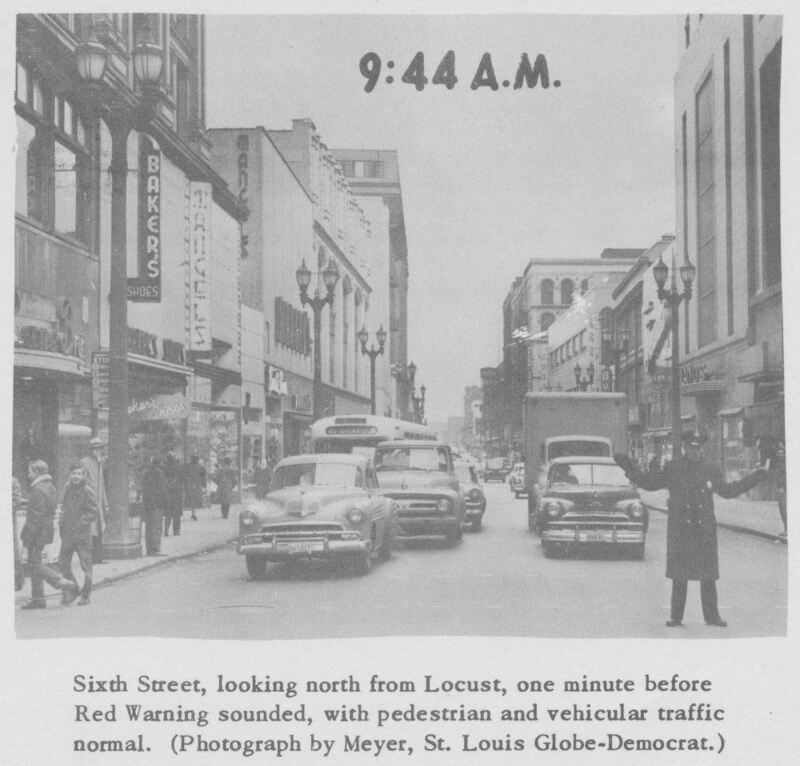 One of the most interesting things I found in the report is on page 7 under Miscellaneous. 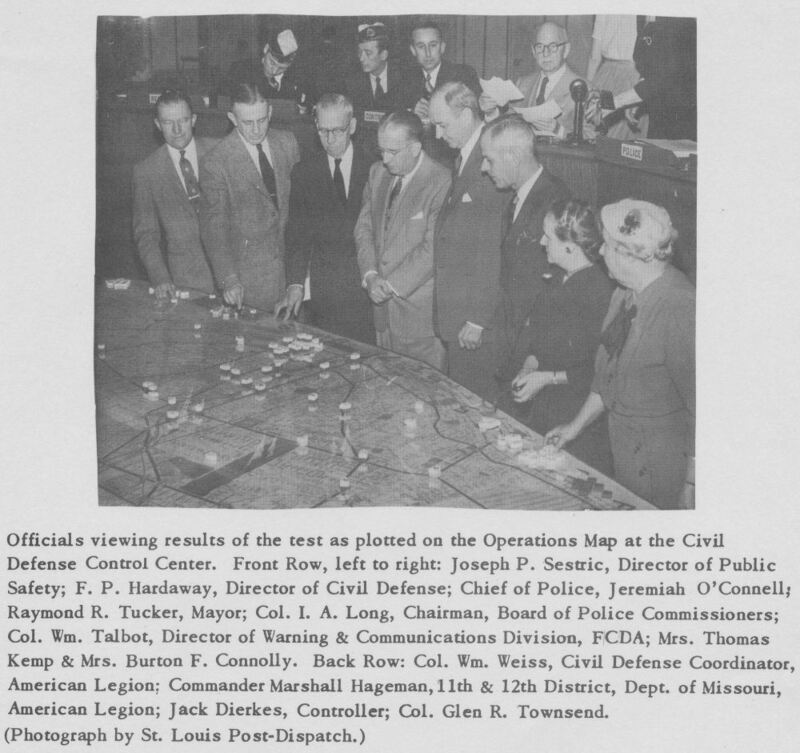 The report states that arrangements were made with the 85th Fighter Interceptor Squadron, USAF, Scott AFB to do a fly-over two minutes before the sounding of the attack warning. 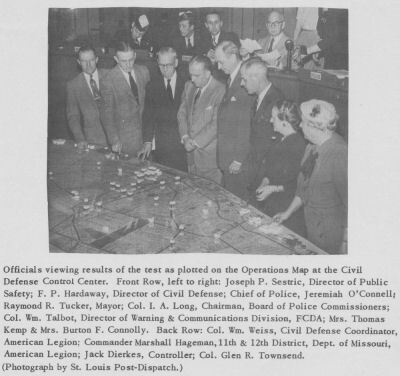 This was to simulate fighters directed to attack approaching enemy aircraft north of St. Louis. I think this is one of the most unique items in my collection but I need to stop myself here because it would be way to involved to summarize the whole report. I have scanned the document and the full report is downloadable in Adobe Pdf format at the link below. I have scanned it in high resolution 200dpi so it is clear and readable though the file size is a bit large. "Donated by The Holroyd Family in honor of Jacqueline Mutz Holroyd-wonderful mother, wonderful friend and a true patriot of the United States of America"
This image scan is from the report and is described as "Car Card / Posters." These were printed to about the same size as the Car Cards seen in the Art Gallery section on this site. 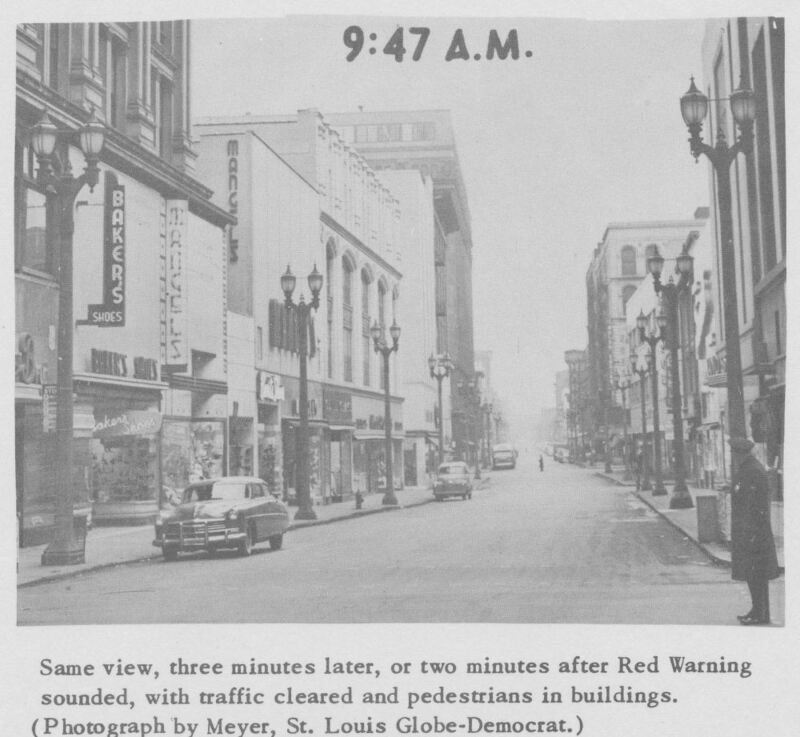 Photos of Sixth Street before and after attack warning sounding of sirens. Notice police officer on street corner and other officer in the street off in the distance. Photos of City Hall and Union Station Shelter Area. Notice shelter sign over tunnel entrance in bottom photo. It's interesting to see in the bottom photo caption that some CD "big shots" attended the drill. 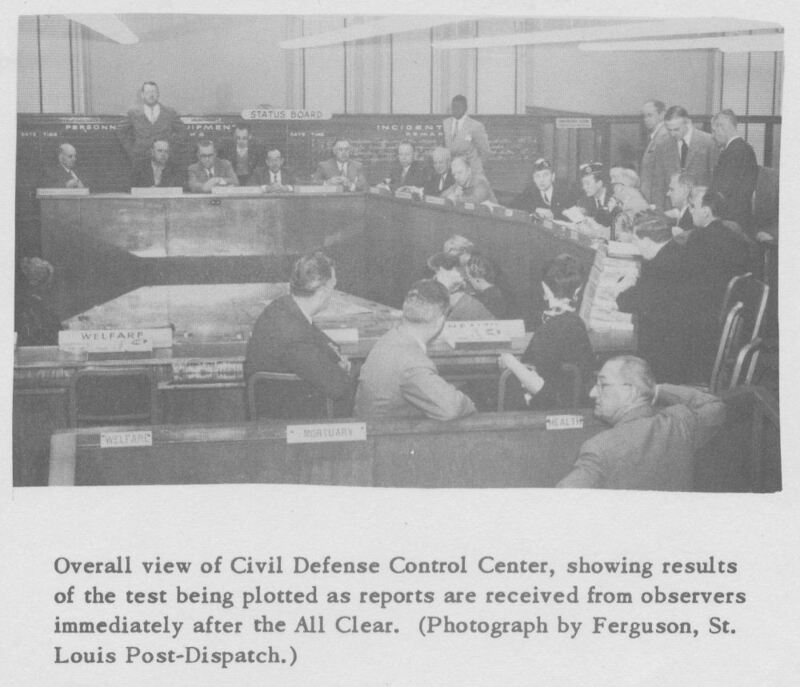 A few images of the Civil Defense Control Center. 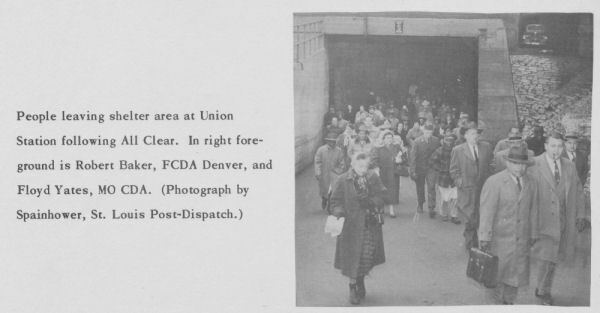 This image scan shows what is described as an "Envelope Stuffer" of which 1,465,000 where distributed.